Best New Player Bonus: Sign up at DraftKings to Get Free Entry Into a Paid Tournament or Contest! DraftKings has the cleanest and most intuitive looks of any DFS site we’ve played. As with all Daily Fantasy sites, the look all starts with the lobby. DraftKings features and incredibly well organized lobby that makes it easy to make your way to any part of the site. Until you’ve seen some of the other lobbies that DFS sites use, you can’t fully appreciate just how clean and organized the DK lobby is. The DK lobby features several different tabs at the towards the top of the screen that separate each type of game you can enter. It’s a nice touch that really helps to keep everything uncluttered and well-separated. On top of the game type tabs, DraftKings also offers a full filtering system you can customize to narrow down the tournament start time, field size, buy-in and more. Of course you can also sort it to show only the sport you are interested in playing. Another great part of the design of DraftKings is that every page on the site contains tabs at the top to go directly to the main lobby, the lineups page or the page to keep track of all your running contests. It doesn’t sound like much, but when you get to the point where you are constantly editing lineups and checking your standing in a tournament, it really proves to be a time saver. Beyond the lobby, one of the places you find yourself visiting most often when playing DFS is the lineup creation page. It’s important to make this page both look good and work smoothly because as many DFS players know, you can spend a lot of time looking over and editing rosters until it’s just right. DraftKings scores high marks on both the visual end and functionality end when it comes to making lineups. Not only can you enter individual lineups directly into a contest, you can create a lineup for a sport and import that lineup into any eligible contest with a single click. Visually, the DK lineup screen has everything you can ask for. The players are well sorted by position and can be further sorted by salary amount, average fantasy points and more. Clicking on a player’s name brings up an awesome player info box that gives you a quick look at that player’s recent fantasy history, up to the minute news and previous salary history among other useful info. It won’t provide any crazy advanced statistics if that’s what you are looking for, but it provides a great quick look at any player as you build your lineup. DraftKings comes out on top when it comes to tracking your team live as games are played. DK has true real-time scoring without the need to refresh or actively do anything in order to stay updated. All relevant stats are adjusted as they happen right on the live scoring page. Individual player totals and your whole team total are also adjusted automatically as these stats change. The live scoring screen not only shows your own team, but also has a full leader board on the left of the screen so you can keep track of everyone else you’re competing against. Your entries move up and down the leader board instantly as soon as you gain or lose any points during tournament. Clicking on the name of anyone on that lead board also gives you a full look at their team and detailed scoring. There is also a search features on the standings to search for friends or any team name you know. The one thing we’d like to see fixed on the search is that you can only search a set number of top players using the search feature. You can still scroll and find all the teams, but it’d be nice to search anyone in the tournament just by name. Another way you can track the action live on DraftKings is through the “My Contest” section. The My Contest section displays all of your current entries and allows you to see what place you are in, how many points you have and even how much money you are currently winning. This section is especially useful if you have multiple entries in a contest or are entered into a number of different contests. If you have multiple lineups, you can quickly edit any lineup or see standings for any contest you are currently in, without ever leaving the My Contest section. In addition to viewing live entries in the My Contest section, you can also view all upcoming contests and your complete 30 day entry history. DraftKings is second to none when it comes to both variety of sports and types of games offered. The site of course offers the four major leagues – NFL, MLB, NBA and NHL. DraftKings also offers NCAA Football and Basketball, but really sets itself apart from other sites by offering PGA Golf and English Premier League Soccer. Not many sites offer those other leagues and it’s a welcome site for fans of those sports and leagues. DK offers a number of different game types as well – as many as we’ve seen on any site. Of course front and center, DK has their large-field guaranteed tournaments that offer top prizes of up to $1 Million. They also offer Head-To-Head contests, 50/50s, smaller leagues, multipliers and Steps tournaments. For definitions and explanations of all of the game types, check out our FAQs. There is also a beginner section that usually contain smaller fields and are only open for you to enter 50 of each sports. This allows users to get comfortable and jump in with similarly skilled beginners before entering some of the bigger tournaments on the site. Live tournament satellites and satellites to larger tournaments are offered throughout the site. If you are low on cash but still want a chance at million dollar tournaments, there are a number of smaller tournaments ($2+) that offer entry into the largest tournaments that DK offers. DraftKings also offers satellites to their own live DFS championship events that they host for the larger sports. These tournaments have been played in places such as the Atlantis Resort in the Bahamas and included top prizes of $1 Million or more and minimum payouts near $10,000 for all participants. DK also offers satellites to other live events including trips and full buy-ins to World Series of Poker and World Poker Tour events throughout the year. As mentioned above, DraftKings also has tournaments that have trips to a number of live events both run by DraftKings such as the 2014 $2.5 Million NFL King Of The Beach fantasy competition that takes place at Atlantis in the Bahamas, and events that don’t involve fantasy such as WSOP events, World Poker Tour events VIP experiences at major sporting events. DraftKings has a generous refer-a-friend program as well. You will receive a portion of the fees paid by the person you refer for the rest of the time they play on DraftKings. The percentage you get ranges from 20% to 35% depending on the number of referrals you make. They also always have other promotions tied to referring your friends, often rewarding free entry into large tournaments. DraftKings is really leading the market when it comes to mobile apps and mobile Daily Fantasy sports. DraftKings has official apps for both Android and iPhone. Both apps are well designed and well-reviewed and contain near full functionality of the desktop websites. You can enter new contests, edit anything to do with your existing teams, deposit and view all of your account info within the app. Please note that while the iPhone app is available directly within the App Store, the Android version must be downloaded directly from the DraftKings website. If you find yourself needing to edit something on the fly and you don’t have access to the apps, DK maintains a good mobile website that you’ll be able to handle anything to do with lineups or tracking your team. The information isn’t presented as well and it’s less intuitive than the apps, but you’ll still be able to monitor and edit your entries. – DraftKings has instant deposits through debit/credit cards and through PayPal and Dwolla. Please note that for withdrawals, DraftKings first refunds your deposits to the original deposit method, so if you prefer to receive all payouts through a certain service, make sure you deposit using that method. – DraftKings recently raised another round funding, this time for $40 million. This in addition to another $30 Million or so that they had already received. Rest assured that DraftKings is well-funded, trustworthy and safe to deposit on. – Keep in mind that there are minor differences on each site’s lineups for individual sports. For example, DraftKings doesn’t use a Kicker in their fantasy football tournaments while FanDuel does. There are small differences for other sports as well. Neither format is necessarily better or worse, but make sure you check out the lineups between the two sites and find out which site’s format you prefer. – DraftKings allows you to swap players out of your lineup in what is referred to as a late swap. If someone gets injured or scratched from the lineup after your contest has started but before that individual player’s game has started, you can swap that player out for another player whose game has yet to start. This policy is different from FanDuel where lineups lock completely once the first game begins, whether you have drafted a player in that particular game or not. As I said above with lineup differences, this is all about preference and it’s very subjective as to which option is better. DraftKings is a choice you can’t go wrong with whether you are new to DFS or if you are a big-time player on the hunt for a fully-featured site. 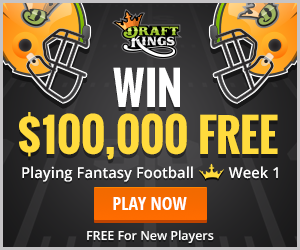 Tons of players, great design that makes it easy to use and constant promotions are just a few of the reasons you can’t ignore DraftKings if you are playing Daily Fantasy Sports. We are big fans of DraftKings and find ourselves recommending the site more than any other to our friends and family who are first joining a Daily Fantasy sports site.